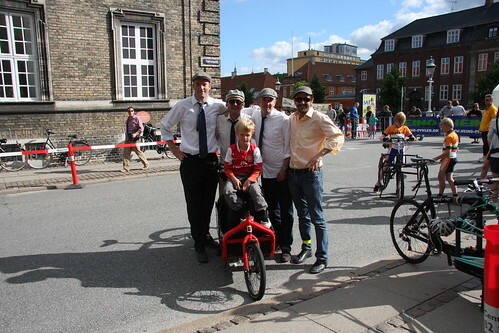 Last Saturday the Danish Cargo Bike Championships were held here in Copenhagen and here's the Copenhagenize Red Rum Team posing with my Bullitt cargo bike, together with my son, Felix. These cargo bike races were a regular event for decades and decades in the city, up until 1960. The bike messengers in Copenhagen would race for bragging rights and honour on old long john bikes, massive cargo bikes and short john delivery bikes. Our team chose to dress for the occasion. The messengers back in the day were well-dressed, with ties and caps and pressed trousers [we didn't bother with those] and were a smashingly handsome addition to the urban landscape. They were nicknamed 'svajere' or 'swayers', because of the movement they made when pedalling the massive bikes. Swaying through the streets. 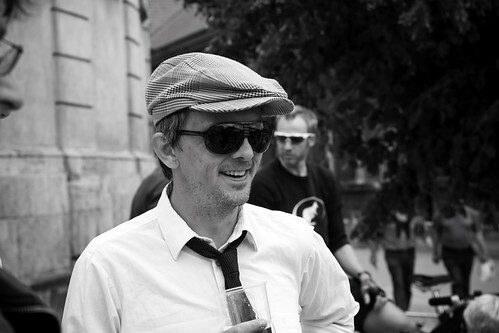 You can read about the dapper history of the Svajere in this post at Copenhagenize and see how frightfully well-dressed they were, especially in the YouTube film at the end. Wouldn't it be brilliant to see bike messengers dressing in style? The races were a load of fun and it was a great day out. 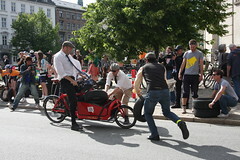 There was the 2 wheeled cargo bike championships, the 3 wheeled championship and the team relay. Copenhagenize Red Rum Team took part in the latter. We stuck to tradition in the races. Basically, you do one lap [1.3 km] with an empty bike and then you load two car tires and a bundle of newspapers onto the bike. Then the remaining three riders do a lap with the heavy load. 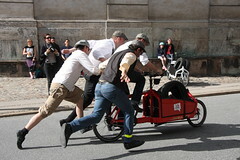 The Copenhagenize Red Rum Team in action. Featuring me, Tiago from Brazil, Joel from Ottawa and Jeff from Washington, DC. For more shots from the Cargo Bike Races, check this longer post over at Copenhagenize.com. Who's the dapper chap in the last picture????? Mikael, I love your blog but why must everything be 'frightful'? Was at Baisekli today and Bryant (who was super friendly and helpful with Martin) was appreciative that you lent your Bullit to their team for the 3rd place finish. From the photos it looked like a fine day. Well done! Enjoying your city splendidly and it's just our first full day. Thanks for the CPH Cycle Tracks and the spot on tips so far!